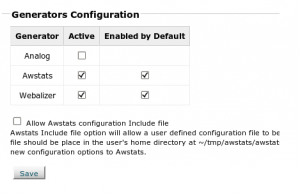 In WHM, go to Statistics Software Configuration and select which statistics programs to enable. The go to WHM > Tweak Settings as well and check the same stats programs under “Stats Programs“. Usually though checking them in one place or the other will enable them in both places. You also want to set the update frequency of the logs, usually to 24 hours. You can check the box for allowing Awstats override configuration files as well, so that users will have their own awstats.conf they can modify in their tmp folders. Again, the Tweak settings and stats configuration are essentially the same setting, so updating one should update them both. Allow users to update Awstats from cPanel – This will put an 'Update Now' link in awStats for each user so they can run their own stats. Keep in mind that if you enabled the local Awstats config for users, they can override this setting. Awstats Reverse Dns Resolution – This resolves IPs in Awstats to hostnames. This can degrade performance on more populated servers, but seems to be preferred by end users. In that example, stats will not run between 8am and 3pm. The server currently is able to keep up with your statistics processing schedule. You may also want to see if there are any very large logs files in /usr/local/apache/domlogs, that could be taking a long time to run. You may want to consider moving that user to another server or running their stats manually via cron job at a certain time every day.